Home » Blog » Homeowners Insurance » Blizzards Bring These Home Insurance Hazards: Are You Covered? A thick dusting of white snow may be part of your winter wonderland dream, but it can also bring a number of risks and hazards to the home. From damage to the roof caused by a heavy load of snow to slip-and-fall injuries occurring on your doorstep, the protection of home insurance is a winter essential. But does your hazard home insurance policy exclude common types of damage or liability? Make sure you’re not missing these five hazards from your coverage before the first snowflake falls. The best rated home insurance offers a fixed rate deductible at a low amount. This is the amount you must pay for before the insurance covers the rest of the repairs. A $500 deductible is easy enough to afford, especially since even minor home repairs tend to cost thousands of dollars. As long as you take basic measures like leaving the taps dripping and running normal heating in your home, your policy will cover a plumber’s services to repair frozen and burst pipes. Of course, your insurance company may question if you’re really taking these precautions if you file for multiple claims every winter. Even when you’re traveling over the holidays to visit family and friends, leave your heat on at a reasonable level to prevent frozen pipes. Landlord property insurance is a good idea if you own rental properties since you can’t verify what tenants are doing to protect their pipes from damage. A blizzard may bring in a surprising amount of rainfall as well, especially in the Midwest and Southern portions of the country. While other effects of a storm are covered, and even flooding from a damaged pipe is usually included, homeowners insurance policies specifically exclude natural flooding. You must purchase a separate policy for flooding events caused by a storm or other natural disasters such as hurricanes. Choose from the National Flood Insurance Program policies or add private insurance coverage from your home insurance provider. Finally, winter conditions in general increase your chances of facing a liability claim after a visitor or worker slips and falls on your icy front steps or the sidewalk in front of your home. Most homeowners insurance includes general liability coverage. 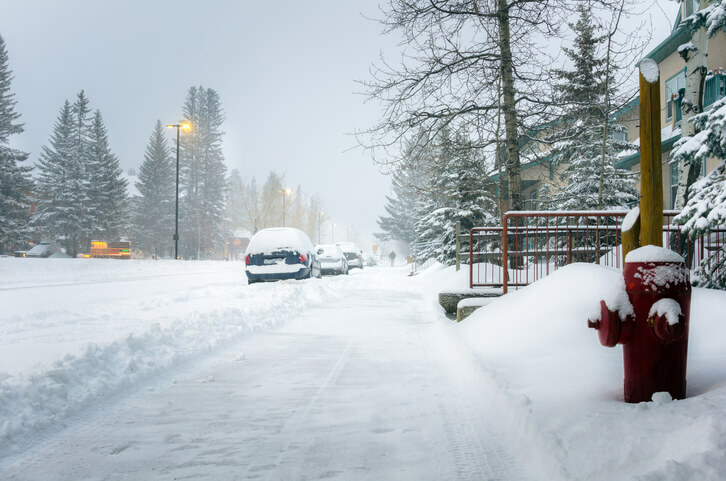 However, the insurer likely stipulates a number of steps you must take to make your walkways and home reasonably safe, such as de-icing your steps and sidewalk. Check in with your insurance company to make sure you’re protecting yourself by limiting your own liability. From mobile home insurance to flood insurance coverage, Freeway Insurance has it all. Contact us today to find out how we can protect you and your home this winter. Call Freeway Insurance by dialing 800-777-5620 to compare insurance rates and get more information.